After you develop a feel for strumming in different combinations of eighths, quarters, and 16ths, you can increase the rhythmic variation to these various groupings by applying syncopation. If you know how to read syncopated notation, you can follow the pattern of syncopation — dots and ties — to steer your rhythmic strumming to a more driving and interesting course. A dot attached to a note increases its rhythmic value by half its original value. A dot attached to a half note (two beats) makes it three beats long. A dotted quarter note is one and a half beats long, or a quarter note plus an eighth note. A tie is a curved line that connects two notes of the same pitch. The value of the note is the combined values of the two notes together, and only the first note is sounded. 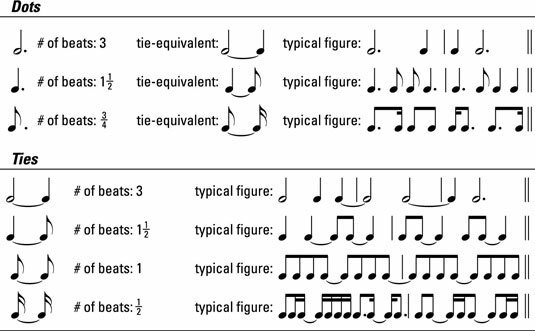 The following figure shows some common syncopation figures employing dots and ties. The top part of the table deals with dots and shows note values, their new value with a dot and the equivalent expressed in ties, and a typical figure using a dot with that note value. The bottom part of the table deals with ties and shows note values, their new value when tied to another note, and a typical figure using a tie with that note value.